The journey to complete a half-mile wide snow mandala begins with one step and pockets stuffed with bananas and chocolate chip cookies. This past month, in the high-altitude snowfields of Powder Mountain, the world-renowned snowshoe artist Simon Beck demonstrated just how far the limits of human creativity can be taken with the consumption of several boxes of snacks and multiple large-scale masterpieces. Equipped with nothing but snowshoes, waterproof gear and a compass, Simon took to the fields of the mighty Wasatch mountain range and traversed well over the equivalent of marathon to ‘draw’ his large-scale ephemeral snow art. Simon Beck stomping out a design. Walking Surface: Slightly undulating snowfields. Finishing time: 8+ hours for a large mural. Food: Chocolate chip cookies, clementines, bananas, water and the occasional burrito from Hidden Lake Ski lodge. Highlights: Emerging patterns, meeting other art-lovers/volunteers, walking-meditation, learning about the artistic process of Simon Beck. Terrain: High alpine snowfields with expansive views of surrounded mountain ranges and the Great Salt Lake. Simon’s process begins with a drawing or a printed image on a regular sheet of printer paper. Once the design is finalized, Simon carefully measures and calculates the steps necessary to enlarge the image for use in the field. Shapes like the Koch triangle or repeating hexagons, which happen to be the basic structural patterns for snowflakes, often make the most successful patterns in Beck’s eyes. Simon teaching a class of volunteers about Koch Triangles. Once in the field, Simon begins by walking the perimeter of the design with the aid of a lensatic compass to accurately calculate his angles. Occasionally, the path of the sun influences the orientation and placement of the drawing since shadows play a vital role in the visual success of each mural. After he finishes the outlines, Simon then begins retracing his steps, in militant fashion, to ‘shade’ the drawings. This process requires less planning and is occasionally carried out by volunteers looking for some quality exercise or artistic inspiration. The uniqueness of Simon’s art form is its ability to attract a wide range of volunteers to shade the large drawings as a group in a beautiful setting. Once Simon trains each person on the correct method of walking, the creation of the artwork becomes fun social practice. A number of exceptional people from all over the country ended up strapping on a pair of snowshoes and taking part in this collaborative process. One volunteer, Sally Turner, who took part in the creation of Simon’s largest snow mural during his residency made a fantastic song about her experience. Check out Sally’s song below! The experience of organizing nearly six drawings up in the snowfields of Powder Mountain made clear how excited people get after seeing Simon’s art. His work doesn’t simply inspire others, it motivates people to get involved and walk together in order to create beautiful, temporal artworks in the snowy outdoors. The resulting image feels like a bonus after taking part in the incredible experience. Simon has been creating these large-scale ephemeral snow murals for roughly 6 years, traveling around the world to share his talents with art lovers, outdoor enthusiasts and powder hounds alike. This past adventure marks only the second time he has worked in the United States, using the fresh snow canvas of Powder Mountain to create his intricate and geometric works. 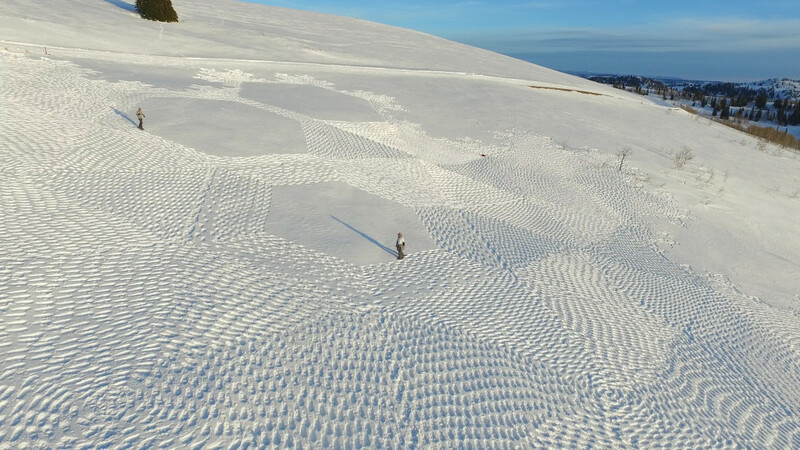 Invited through the Summit AIR program, he plans to return next season to create more mind-blowingly intricate snow patterns that perfectly capture the human journey through natural terrains, only to be eventually swept away by the wind or covered with a fresh blanket of snow. A volunteer on the Elk Reserve area of Powder Mountain. The completed half-mile wide mural from 2016. A section of the 2016 mural based loosely off of the Julia Set. The artist himself and his favorite snack. A detail shot of the snowfield/canvas with Ben Lomond peak in the top right. Three murals being worked on in a field on Powder Mountain. A repeating hexagonal pattern mural. Sunset over Simon’s first mural on Powder Mountain of 2016.